Background: The clinical manifestations of acute heart failure (AHF) and respiratory infection (RI) frequently overlap in patients presenting with dyspnoea at the emergency department (ED). The neutrophil to lymphocyte (N/L) and platelet to lymphocyte (P/L) ratios have been proposed as diagnostic and prognostic indices in this setting. Objective: To evaluate the ability of N/L and P/L ratios to discriminate the cause of dyspnoea in patients admitted with an initial diagnosis of AHF-RI. 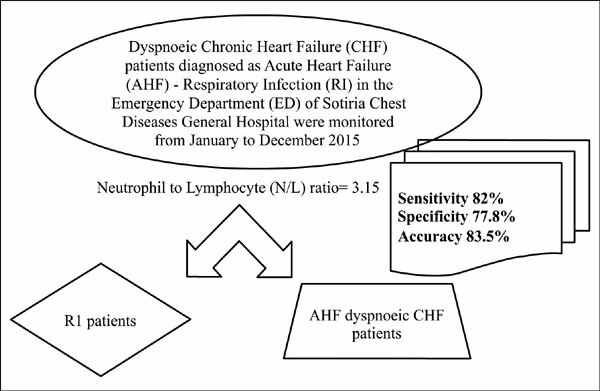 Methods: 100 consecutive dyspnoeic chronic heart failure (CHF) patients diagnosed as AHF-RI in the ED of Sotiria Chest Diseases General Hospital were monitored for a series of parameters. The diagnostic efficacy of the registered parameters in discriminating the AHF from RI patients was evaluated. Results: The N/L and P/L ratios did not differ statistically depending on the pharmaceutical therapy applied in the study population, with the exception of furosemide and spironolactone-treated patients, who both had higher ratio values. In the AHF patients, only N/L was influenced by the pharmaceutical treatment administered. Patients with higher N/L ratio values were more likely to have RI-triggereddyspnoea (odds ratio, OR=1.35, 95% confidence interval-CI: 0.99-1.42, p=0.047). ROC curve (receiver operating characteristic curve) analysis revealed a significant ability of the N/L ratio to differentiate pure AHF from RI (area under the curve AUC=0.773, p<0.001, cut-off value N/L= 3.15). Conclusion: The N/L ratio, a cheap and easily assessed biomarker, warrants further investigation as a potential diagnostic tool for the ED physician facing dyspnoeic CHF patients. Keywords: Acute heart failure, respiratory infection, neutrophil to lymphocyte ratio, platelet to lymphocyte ratio, CHF, WBC. Keywords:Acute heart failure, respiratory infection, neutrophil to lymphocyte ratio, platelet to lymphocyte ratio, CHF, WBC. Abstract:Background: The clinical manifestations of acute heart failure (AHF) and respiratory infection (RI) frequently overlap in patients presenting with dyspnoea at the emergency department (ED). The neutrophil to lymphocyte (N/L) and platelet to lymphocyte (P/L) ratios have been proposed as diagnostic and prognostic indices in this setting.